Rebels, called the M23, have taken Goma, the main city of North Kivu, one of the Democratic Republic of Congo (DRC)’s eastern provinces. Their plan is to march to Bukavu, the main city of South Kivu, and from there, they say, across the massive country to Kinshasa, the Congo’s capital. A geographical note is in order. The DRC’s principal cities are part of greater urban areas that cross international borders. Look at the capital, Kinshasa, on a map, and you will see Brazzaville, the capital of the other Congo, right next to it. Goma, which the rebels currently control, borders the Rwandan city of Gisenyi. Bukavu, which the M23 rebels threaten to go to next, borders the Rwandan city of Cyangugu. The geographical note should be accompanied by an historical note. This military pattern, of a rebellion seizing Goma, then Bukavu, then marching west deeper into the DRC, has happened before. It happened in 1996, when the rebels, who called themselves the AFDL, overthrew Mobutu Sese Seko. The AFDL was militarily and politically subordinate to the Rwandan army, and had help from the Ugandan army as well. They were successful. Mobutu was ousted, Laurent Kabila was installed, and the country was renamed from Zaire to the Democratic Republic of Congo. The same pattern repeated itself in 1998, when the rebels, then called the RCD, took Goma and attempted to get rid of Laurent Kabila. The RCD, like the AFDL, was a creation and an instrument of Rwanda and Uganda. The RCD was not as successful as the AFDL: it was stalemated when Laurent Kabila got military help from Angola and Zimbabwe. The RCD split, with Rwandan and Ugandan controlled factions coming to blows over the spoils of the Congo. But even though they did not get to impose their will nationally, the Rwandan-sponsored militia groups (the spawn of the RCD) did impose their will in the east. They continued to control the mines, they continued to effectively occupy and rule the Kivus, and eventually, they were incorporated into the Congolese Army through processes called brassage and mixage. There are nuances to this story, but it can be summarized in one phrase: the eastern Congo is under Rwandan control, and has been since 1996. The DRC’s government has tried, since 1998, to re-assert control over the Kivus, and the warfare in the east is over control: of the land, of the people, and of course, of the mines. 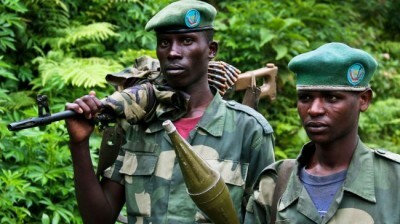 Rwanda, of course, denies that it has anything to do with these rebels. But a look at one of M23’s commanders, Bosco ‘The Terminator’ Ntaganda, is indicative. Ntaganda was born in Rwanda, and fought in the Rwandan civil war of 1990, on the side of victorious RPF that took over Rwanda in 1994. When Rwanda invaded the Congo along with its creation, the AFDL, Ntaganda was there, and he stayed. He was part of two other Congolese armed groups, both of which opposed the Congolese government: The Union of Congolese Patriots in Ituri, and the CNDP (National Congress for the Defense of the People), before he joined the M23. Every group Ntaganda has been a part of has committed amply documented war crimes and crimes against humanity. The CNDP, like M23, is abundantly documented to have been supported by Rwanda. Ntaganda is indicative, but not unique. An examination of other leaders of Congolese rebellions, like James Kabarebe and Laurent Nkunda, reveals similar career paths: from the Rwandan army, into Congolese rebel armies, and sometimes back and forth. The rebels are supported by Rwanda, but Rwanda is a small country and the DRC is a huge one. Why is Rwanda able to do so much to its giant neighbour? The Rwandan army has been particularly well-organized since the 1990s, and the country’s President, Paul Kagame, is a favourite of the U.S. (where he went to military school). Kagame’s Rwanda has always looked for military solutions to political problems, because of its disproportionate strength in that arena. Rwanda has also had important diplomatic support from the U.S. and the UK, although a few other European countries have withdrawn diplomatic support and aid after exposures of Rwanda’s violent role in the eastern Congo. Justin Podur visited Bukavu in 2009 and 2011. Justin is the author of Haiti’s New Dictatorship (Pluto Press 2012) and maintains a blog at killingtrain.com where this article first appeared.